A real estate practice exam is a mock test designed to help prospective agents practice for the state or national real estate exams. We considered 15 real estate practice exam providers to identify the six best, including the best overall, by considering state availability, pass rates, pass guarantees, ease of use, customer support, and more. When preparing for the real estate licensing exam, aspiring agents need easy-to-use real estate practice exams and exam prep with a low price point, a high pass rate, and entertaining study tools, like games. Budget is often a factor and some test-takers just need free practice exams, while others prefer more robust study tools like flashcards, quizzes, and student forums. Pricing – Becoming a real estate agent can be expensive and you may have to support yourself for a few months without an income while you prepare, so it’s important to get the best value possible. Pass Rate and Guarantee – Pass rates and pass guarantees ensure that you get the most out of your real estate practice exams by giving you ample opportunity to pass your exam. For more information on passage requirements in each state, check out our guide to getting a real estate license. Ease of Use – Getting into real estate can be a long and difficult process, so we evaluated the best real estate practice exam providers to find ones that are easy to navigate. Practice Questions and Exams – The number and quality of practice questions and practice exams is one of the most important factors when choosing the best real estate practice exam provider. Access to Materials – The length of time a test-taker has access to study materials varies by exam prep provider. Some practice exam providers will let you extend your access at no additional cost, while others require you to pay for continued access. Collaborative Study – Some exam prep platforms provide users access to collaborative study tools like user forums and Facebook groups to help better understand the content. Customer Support – The ability to get fast and helpful support from their exam prep software provider is extremely important—especially when you’re up against an exam deadline. We chose Real Estate Exam Scholar as the overall best real estate practice exam provider. Real Estate Exam Scholar is available in all 50 states, has a 98% pass rate, and offers test-takers a money back guarantee. Try Real Estate Exam Scholar if you want high-quality real estate exam prep at a great value. Real Estate Exam Scholar is a real estate practice exam and preparation service that offers courses for all 50 states. The platform is our overall pick for real estate practice prep because of its low price compared to other options, widespread availability, and high pass rate. This makes it right for aspiring agents looking for a large volume of practice questions and exams at a great value. Real Estate Exam Scholar is priced at $29 for all 50 states, making it the best value of the options we evaluated. In addition, users can extend access to practice materials for an additional fee. The platform also offers a money back guarantee for those who do not pass the exam on their first try. The course includes six months of access to over 1,200 practice questions, 25+ practice exams, a 95% pass rate, and more. Materials are also available in all 50 states and for a price lower than other services. For that reason, the features are best suited to agents who want extensive practice materials at a low price. Real Estate Exam Scholar offers state-specific practice exam material for all 50 states. This is substantially more coverage than Kaplan (20 states), Night Before the Exam (22 states), and Real Estate Express (25 states). For people who live in states not covered by other options we considered, Real Estate Exam Scholar is the only choice for real estate practice exams. Real Estate Exam Scholar boasts an impressive 95% pass rate. Plus, like other options we evaluated, Real Estate Exam Scholar offers a money back guarantee. If you don’t pass your real estate exam on the first try, Real Estate Exam Scholar will refund your money. In contrast, Kaplan doesn’t offer a money back guarantee at all and Night Before the Exam offers 90 more days access if you fail, but for twice the price of Real Estate Exam Scholar. Real Estate Exam Scholar features 1,200+ multiple choice practice questions broken into smaller online quizzes for different categories. This means you can practice at your own pace and focus more intensely on the areas in which you need the most improvement. When you finish a quiz, Exam Scholar scores it and provides a two- to three-sentence explanation for each answer. In addition to practice questions, Exam Scholar gives you online flashcards to practice definitions, as well as a glossary and printable reference guides. Another great feature of Real Estate Exam Scholar is the six-month access to their practice exams. This can come in very handy, especially if you have a situation where you’re facing a long gap between taking your real estate course and taking your exam. In contrast, Kaplan offers only 90-day access. Night Before the Exam also offers six months’ access, but at twice the price, there is very little reason to use Night Before the Exam over Real Estate Exam Scholar. Test-takers who took Real Estate Exam Scholar found the platform to be extremely easy to use as both a prep course and as last-minute prep. 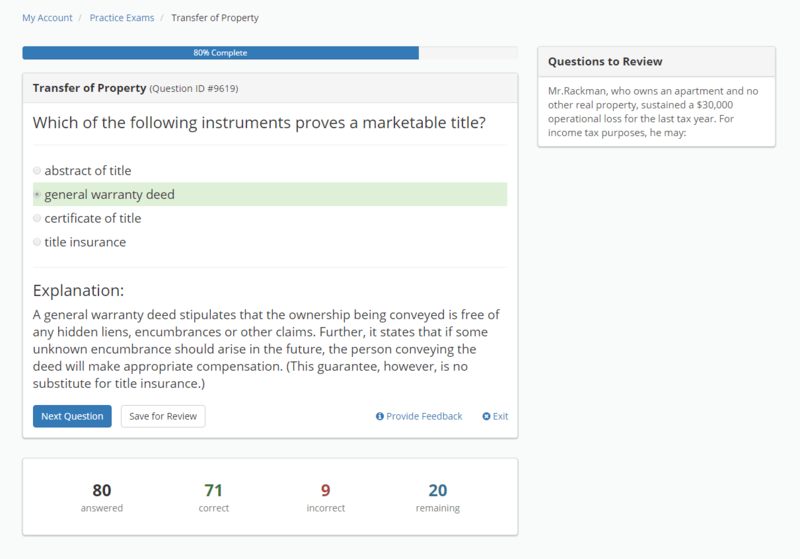 There is no Real Estate Exam Scholar app, but the practice questions are easy to navigate and the platform works well on computers, tablets, and phones. Users also report that Real Estate Exam Scholar makes it easy to track progress. Users can contact Real Estate Exam Scholar specialists via Facebook messenger or their online chat tool, where you can talk to an agent during normal business hours. What’s more, you can speak to their specialists via online form submission, although it is unclear how quickly you will receive a response. Overall, Real Estate Exam Scholar’s customer support appears less robust than other providers we evaluated. Real Estate Exam Scholar offers robust practice questions and exams at a low price and with a money back guarantee. As such, we had a difficult time identifying anything the platform is missing. Instead, Real Estate Exam Scholar has the most extensive geographic coverage at the lowest price. Real Estate Exam Scholar students report that the study materials are easy to use and accessible from any internet-enabled device. Some users who purchased the test prep course at the last minute said they had an excellent experience and passed the exam on the first try. As our top pick, Real Estate Exam Scholar offers test-takers the ability to study practice questions and take practice exams to prepare for the real estate exam in every state. Not only is Real Estate Exam Scholar available at the lowest price point we considered, you can try Real Estate Exam Scholar’s flashcards for free before signing up to see how the content works for you. Real Estate Express is a real estate education and exam prep company that offers pre-licensing education and à la carte practice exams. Overall, the platform offers courses in 25 states and boasts a 78% passage rate. Choose the à la carte Exam Prep Master, a package offered by Real Estate Express, if you want to purchase practice exams; this package also offer access to pre-licensing courses for an additional fee. Real Estate Express’ Exam Prep Master costs $69 for access to 17 practice exams, as well as several pre-licensing course packages at various price points. Course packages range in cost from $239 to $459, depending on the customer support and resources included. Test-takers can save 25% off course fees using promo code LAUNCH25. As a stand-alone product, Exam Prep Master includes 17 state-specific practice exams, including general practice exams, themed practice exams, and final practice exams. In general, Real Estate Express’ online education materials are available in 25 states, boast a pass rate of 78%, and provide students access to course materials for 150 days—almost as long as Real Estate Exam Scholar. Real Estate Express is available in 25 states—fewer than Real Estate Exam Scholar but more than many of the options we considered. Online real estate classes are not offered in Ohio, North Carolina, Massachusetts, and Maryland. However, Real Estate Express does offer online real estate classes in Florida and Missouri. Visit the Real Estate Express website for a complete listing of where Exam Prep Master and pre-licensing education courses are offered. The Real Estate Express pass rate is 78%. Plus, the company guarantees that you won’t pay anything unless you pass the exam on your first try. To take advantage of the guarantee, test-takers just have to submit the state’s failure notice within 30 days of receiving it. However, because of state law, the Real Estate Express pass guarantee is not available in Florida or Tennessee. As a stand-alone product, Exam Prep Master includes 17 state-specific practice exams. Generally, this includes 12 general practice exams, three themed practice exams, and two final practice exams. 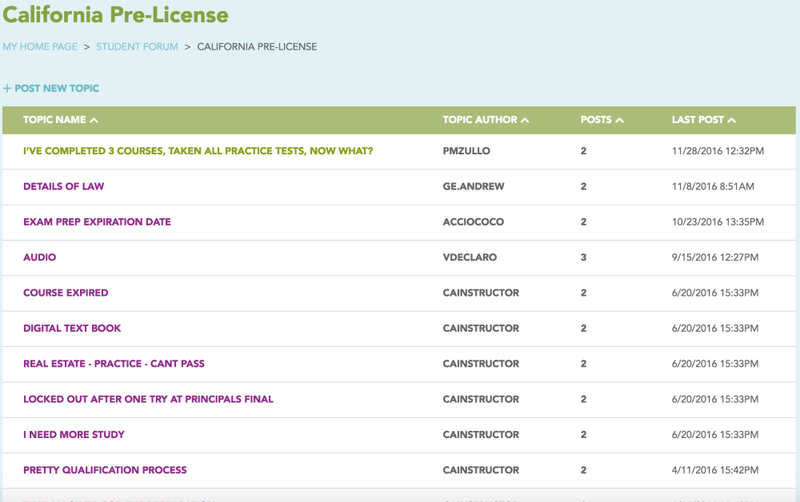 Pre-licensing education courses provide users study guides, exam prep tests, questions, and answers. Real Estate Express also offers three learning formats: coach, pace, and power, each structured to help test-takers prepare for actual exam circumstances. Test-takers who choose Real Estate Express have 150 days from the time of purchase to take the practice exams. During this time, students can take the exams as many times as they need to achieve a minimum grade of 80% on all of them. Once you complete the Real Estate Express practice exams, you must sit for the licensing exam within 30 days to take advantage of the money back guarantee. Users report that Real Estate Express is easy to sign up for and easy to navigate once you begin the study process. 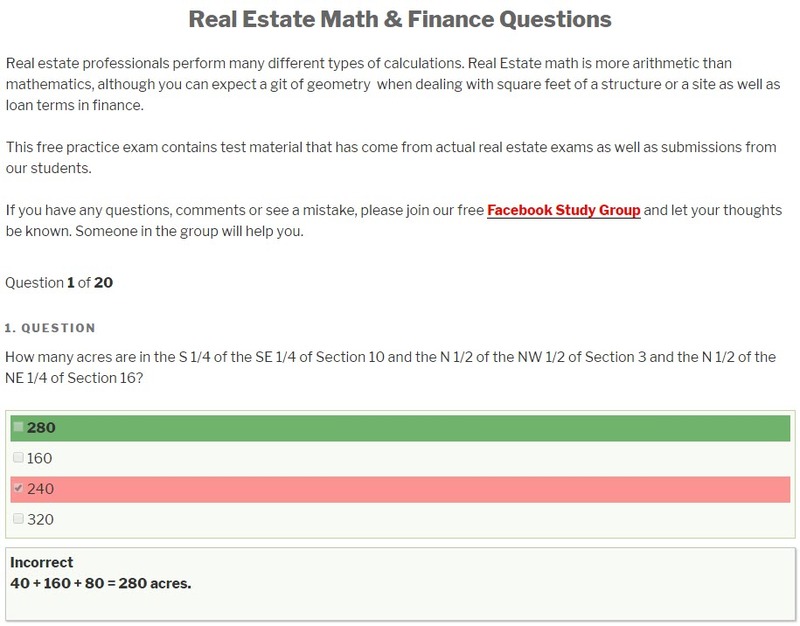 What’s more, the Real Estate Express Student Forum makes it easy for test-takers to discuss study topics and practice questions—similar to the Facebook group offered by PrepAgent. The Real Estate Express Student Support department is available to users Monday through Friday during normal business hours and generally responds within 24 hours. You can also submit an inquiry online or chat with one of their reps during business hours. In addition, there is a “Report an Error” button in the corner of every course screen so users can contact technical support as they move through the review materials. Unlike Kaplan and other options we considered, Real Estate Express does not offer video instruction or an interactive study group tool. Instead, the service includes a student forum, but students find that it is not very active. What’s more, users report that the platform is best for independent learners. 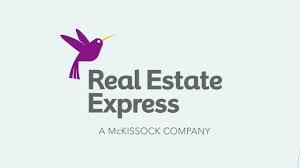 In general, Real Estate Express users find that it is easy to sign up for and easy to use. However, in contrast to other options like Night Before the Exam, reviews indicate that the prep course is extremely dry and makes it difficult to stay engaged. This is also different from PrepAgent, which makes it easier for audio-visual learners to absorb the content. Real Estate Express Exam Prep Master makes it easy to purchase real estate practice exams to hone your test-taking skills. For that reason, Real Estate Express is a great option if you plan to study on your own and want access to the best real estate practice exams. Kaplan is a real estate exam prep course that provides flexible learning options. Test-takers can opt for classroom-based courses, online video lectures, or at-home written materials. For that reason, the platform is great for students who want to choose from a number of test prep experiences and have room in their budget for one of the most expensive option we considered. Costing between $59 and $199 depending on the state, Kaplan is significantly more expensive than Real Estate Exam Scholar and, for some states, significantly more than Night Before the Exam as well. However, considering they offer audio lessons and live webinar lectures, some might find the extra expense worth the money. Kaplan is a real estate education company that provides pre-licensing courses and practice materials. The platform offers materials for 20 states but does not offer a money back guarantee. However, it is an excellent option for agents who need licensing courses and practice exams with flexible learning options. Kaplan is available in 20 states, fewer than other options we considered. Some of the states where Kaplan is available include New York, California, Illinois, New Mexico, North Carolina, and Georgia. However, they are not available in Florida, South Carolina, or Massachusetts. To check if Kaplan is available in your state, click here. Kaplan has a pass rate just over 80% but, unlike other options we considered, does not offer a money back guarantee. However, if you don’t pass your exam, you can contact customer service and retake the same class within six months of the date purchased. Under Kaplan’s PassProtection™ program, you may have to purchase new test materials—something not required with other platforms we evaluated. Kaplan offers flexible educational resources like audio lessons and lectures you can participate in online or in a classroom setting. Real Estate Exam Scholar doesn’t offer audio lessons at all, and while Night Before the Exam offers animated videos, they don’t offer live webinars or audio lessons. Kaplan also lets you take a full practice exam or build custom quizzes by setting the number of questions and choosing areas of focus. Kaplan offers a full six months of access to their practice exams. According to their terms of service, users may be able to extend access to course materials once for up to an additional six months. However, users will have to pay 50% of the course’s current retail price, unlike Night Before the Exam, which allows a free extension period. Kaplan users report that the program helped prepare them for their real estate exam. However, many found the review materials to be extremely boring. This is in contrast to providers like Night Before the Exam, PrepAgent, and Real Estate Exam Ninja, which make studying more entertaining and accessible. In addition, we had some difficulty navigating the Kaplan website to find the test prep resources we needed. Kaplan offers its students 24/7 access to their technical support team via phone and email. In addition, Kaplan instructors are available to answer questions about course content and curriculum via email. However, user reviews reveal that Kaplan’s customer service team is not as responsive or helpful as other real estate practice exam providers. Unlike the other options we considered, Kaplan does not offer a money back guarantee if you don’t pass the exam the first time. In addition, Kaplan’s real estate practice exams and prep materials aren’t available in as many states as other prep courses. As such, Kaplan is only a good option if you want access to flexible at-home or in-classroom exam prep in some states. Some Kaplan users report that the teachers and course materials are interesting and helped them pass the real estate exam the first time. Others found that the ability to get a “classroom” feel online makes it a unique exam prep platform. However, some agents revealed there is a lot of reading involved in the Kaplan prep process, and that it was both boring and difficult to review practice questions. Kaplan is a great option if you want the ability to take in-classroom real estate exam prep courses or access those courses online. Check out their OnDemand course demo to find out if their prep material will fit your learning style. PrepAgent is an online real estate exam prep course that specializes in audio and video learning. The platform offers three levels of study materials but stands out because of its audio and video resources like YouTube tutorials and webinars. PrepAgent is more expensive than Real Estate Scholar, but is a great option if you’re an audio-visual learner. PrepAgent offers three plans with differing exam prep materials. Basic costs $49 (more than Real Estate Scholar) and includes practice questions and exams. Deluxe and Premium plans cost $69 and $89, respectively, and include more advanced audio and video-based learning tools. Users can upgrade their plan any time and there’s a 100% money back guarantee. PrepAgent’s Basic, Deluxe, and Premium plans offer a range of study materials from practice questions to live webinars. The platform is available in all 50 states and offers users a 100% money back guarantee within 120 days of purchasing the materials, less than offered by Real Estate Express. Plus, added features like the private Facebook group and availability of one-on-one coaching sessions make it a unique platform. Real estate exam prep content is available through PrepAgent for all 50 states, and also covers questions for the national real estate licensing exam. This is the same coverage as Real Estate Exam Scholar but greater than other options we evaluated, like Kaplan and Real Estate Express. This widespread availability combined with the availability of video, audio, and webinar-based learning make it a great option for test-takers who prefer video learning. PrepAgent’s pass rate isn’t published online, but it offers students a 100% money back guarantee within 120 days of purchasing the materials. In contrast to other providers that only offer a pass guarantee, PrepAgent’s satisfaction guarantee means you don’t have to prove that you failed your exam to get your money back. This feature makes PrepAgent a safer option than some of the other platforms we evaluated. The PrepAgent curriculum includes national and state-specific questions, but the format depends on the package you choose. For example, all of the plans include unlimited practice tests and thousands of practice questions. However, exam prep videos, audio lessons, and flashcards are reserved for the Deluxe and Premium Plans. Similarly, keyword outlines, vocabulary lists, and webinars are only available to Premium users. The length of time students can access exam prep materials depends on the package you choose. Test-takers who use the Basic package have access to the materials for seven days; Deluxe users have access for 30 days, and Premium users have access for one year. However, if you need more time, you can renew your account instantly online and all of your existing progress will be restored. Users report that the PrepAgent platform is extremely easy to navigate and streamlines the exam-taking process. What’s more, Deluxe and Premium members have access to the PrepAgent exam prep e-book, which compiles 100 pages of important exam concepts in one place. The platform also makes it easy to access study videos through YouTube and lets you review practice questions you answered incorrectly. Like other courses we considered, PrepAgent offers phone support and an online form for submitting questions regarding their packages, website, and user accounts. However, PrepAgent’s customer support really stands out because of their private Facebook page that’s only available to registered users. Users who join the group can not only get answers from PrepAgent staff, they can discuss exam questions and get feedback from other test-takers. PrepAgent is a comprehensive real estate practice exam provider but does not offer exam prep videos or other study materials as part of their Basic plan. However, the platform’s Deluxe package is priced comparably to other providers and offers a wide range of learning tools. PrepAgent has a five-star rating with over 600 reviews on Facebook. Satisfied users report that PrepAgent’s materials do an excellent job of presenting real estate terms, theory, and reasoning. Furthermore, test-takers rave about the YouTube tutorials and the private coaching sessions that are available. In fact, online reviews were so positive that it’s difficult to find negative feedback. PrepAgent lets test-takers build a real estate exam prep experience that fits their time frame and learning style. It also features a variety of video-based materials, like interactive webinars. For that reason, it’s a great option for students who prefer audio or video-based exam prep. Plus, PrepAgent lets you take one of their practice exams for free so you can get a feel for the platform. Night Before the Exam is an exam prep service that provides entertaining ways to learn real estate material. The platform is pricier than other options but offers entertaining and user-friendly study methods. Try Night Before the Exam if you need an entertaining exam prep course without the monotony of standard exam prep courses. Night Before the Exam costs $59.95, comparable to Kaplan for many states, and much less expensive than Real Estate Express. However, it is still twice the price of Real Estate Exam Scholar. Even so, Night Before the Exam is reasonably priced given their money back pass guarantee and entertaining review methods. Night Before the Exam includes a variety of features that make it easy to use and accessible for test-takers who hate to study. The option is only available in 22 states, but the practice materials are entertaining and responsive to practice exam performance. Plus, if you fail the exam, Night Before the Exam will extend your access at no additional charge. Night Before the Exam is available in 22 states, including New Jersey, New York, Florida, and Massachusetts. However, the platform is not available in Washington, DC, Iowa, or North Dakota. To check if Night Before the Exam is available in your state, click here. Night Before the Exam doesn’t publish their pass rate. However, in every state but Florida, Night Before the Exam guarantees that if you don’t pass after mastering their materials and simulated exams, they give a 100% refund upon receipt of failure notice. Mastering means your competency meters are showing “good” in all of the exam categories. Night Before the Exam also features a satisfaction guarantee, which lets users get their money back within the first 24 hours if they don’t like the service. Night Before the Exam offers printable cheat sheets, a competency meter to measure your odds of passing, learning games like crosswords, and animated videos. If you get bored easily or need a little fun to keep you focused, Night Before the Exam is your best option. The number of practice questions varies based on which state you’re in, and Night Before the Exam automatically generates study and cheat sheets tailored to your strengths and weaknesses after each practice exam session. Night Before the Exam only offers 90 days of access to their practice exams. However, if you fail your test, they will extend that access by another 90 days at no additional charge. This is in contrast to other options we considered, like Real Estate Express, which charges users for additional access to the review materials. Night Before the Exam is one of the most user-friendly options we considered—largely because of the platform’s Smart Study dashboard that lets users track their progress in each subject area. 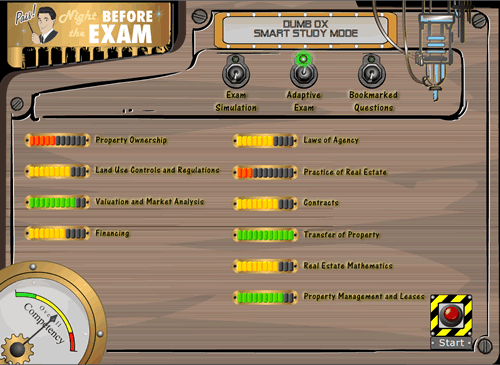 There is also a competency meter that helps agents evaluate their overall success and likelihood of passing the exam. What’s more, Night Before the Exam’s practice tools are intuitive because they are based on games like crossword puzzles. Night Before the Exam offers customer support via phone and online form submission. However, it’s recommended that users take advantage of the online form to receive a response within one day. Overall, users report that the platform’s customer support team is helpful and responsive. Night Before the Exam does not offer real estate exam takers the opportunity to take a free practice exam or otherwise test drive the software before purchasing. However, the platform does offer a 24-hour satisfaction guarantee. So, if you purchase Night Before the Exam and quickly discover that it is not consistent with your learning style, you can get your money back. Users who tried Night Before the Exam found the platform easy to use and entertaining. Agents reported that the practice questions and feedback prepared them for the exam, and that customer service responded to questions quickly. However, a smaller number of users reported issues with customer service and found the review materials to be incomplete. Night Before the Exam is a great real estate practice exam platform for test-takers who have difficulty focusing on study material. The platform’s progress dashboard and practice games make it easy to learn materials, and the pass and satisfaction guarantees mean you’ll get the most out of the platform or get your money back. Real Estate Exam Ninja provides free national real estate practice exams and premium real estate exam prep material. The platform offers free practice exams in multiple subject areas plus a free, timed national real estate exam. Choose this option for several free exams plus the option to sign up for additional exams and practice questions. Real Estate Exam Ninja offers free real estate practice exams plus additional paid packages. Cram Session costs $9.99 for 48 hours of access to practice questions, while Focused Learning is $17.99 for 30 days of access to questions and flashcards. Finally, R.E. Exam Ninja costs $24.99 for more extensive review materials. Real Estate Exam Ninja is the best choice for test-takers who want to test their skills with practice exams but don’t have room in their budget for more expensive study materials and courses. Paid packages provide users with practice questions, flashcards, audio lessons, and a money back guarantee. Free practice tests are also available online without signing up. Real Estate Exam Ninja only offers national real estate exam content, making it less robust than other options we considered. However, the platform does offer free access to several national real estate practice exams, making it more accessible to aspiring agents on a budget. Real Estate Exam Ninja doesn’t publish their pass rate. However, they do offer a 100% money back guarantee to their users if they fail the exam. This money back guarantee, combined with their already low prices and the availability of free practice exams, makes it an excellent option—especially if you don’t have room in your budget for one of the more expensive options that has a confirmed pass rate. In addition to national real estate practice exams, Real Estate Exam Ninja gives all of its paid users access to thousands of national exam questions. Focused Learning and R.E. Exam Ninja users also have access to more advanced review materials, like over 700 vocabulary flashcards, audio lessons you can stream from your phone or computer, and printable crossword puzzles (similar to those offered by Night Before the Exam). 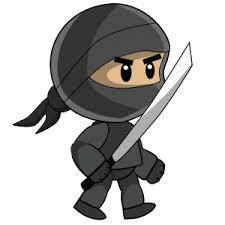 Access to materials through Real Estate Exam Ninja depends on the package you choose. For example, Cram Session users get 48 hours to study—presumably just before their exam. Focused Learning and R.E. Exam Ninja users get one week and 30 days of access, respectively. Though the price of Real Estate Exam Ninja is lower than the other options we considered, the access to study materials is substantially shorter. Real Estate Exam Ninja’s free exams can be easily accessed from the “Practice Tests” portion of company’s website. Once you select an exam, the website guides you through each question, checks your answer, and provides an explanation of the correct answer. Real Estate Exam Ninja doesn’t provide any contact information for customer service or technical support on their main website. However, they do have an online study group through Facebook that allows users to troubleshoot and discuss practice questions. Users or interested test-takers can also get in touch with Real Estate Exam Ninja through the chat function on their main Facebook page and get an immediate response during normal business hours. Real Estate Exam Ninja’s most substantial shortcoming is the lack of state-specific exam material. Instead, the platform offers users materials to prepare for the national real estate exam. Even so, Real Estate Exam Ninja is an excellent option for test-takers who want free real estate practice exams without signing up for a whole review course. Many test-takers who use Real Estate Exam Ninja’s free practice exams found that they were extremely helpful and an excellent supplement to their existing study program. What’s more, some users reported that some of the practice questions were exactly the same as those on the real exam. Negative reviews were limited, but one agent indicated that much of the content tested on the final timed practice exam was not covered in any of the free exams. If you’ve already studied for the national real estate exam and need free practice exams or just want to evaluate your progress with a practice exam, check out Real Estate Exam Ninja. Their free real estate practice exams and range of paid test prep options make it an excellent platform for test-takers who are on a tight budget. Real estate practice exam providers offer a large number of practice questions and resources to help aspiring real estate agents prepare for national and state-specific real estate licensing exams. Through resources like collaborative study tools (such as forums and one-on-one training), test-takers can quickly learn and review exam material—even at the last minute. Real Estate Exam Scholar made the top of our list because of its broad availability, high pass rate, and excellent quality review materials. If you’ve already taken the required pre-licensing courses and need the best real estate practice exam provider, try Real Estate Exam Scholar for only $29. Click below to learn more. I have a question. I am retired and get Social Security. I have money for my basic necessities but not much left over. Sometimes I get a temp assignment, but I cannot count on that income. I believe the time will come when I will get money from a certain issue. I would like to buy a small condo and flip it. Do I need to take real estate classes? I want to be able to talk intelligently to the people that will be interested in purchasing my properties. In all 50 states, you need to pass an exam in order to earn your real estate license. In most states, you need to take real estate classes as well. We have an article with more information about how to get a real estate license here.